Camel is a staple statement colour every winter season, if you are like me who love wearing all black everyday, yes I know its boring, but this camel coat would not fail you; bringing all the statement and head turning look with this coat! I love how long this coat is, so it can cover all my legs from the cold. 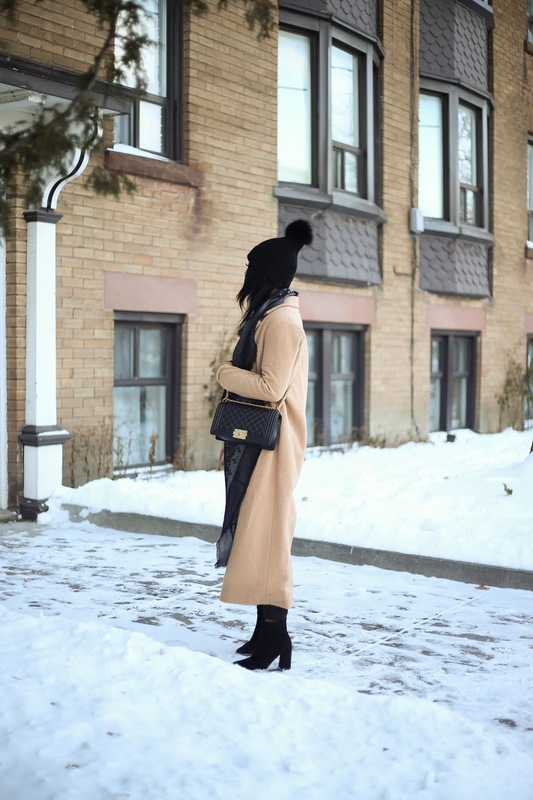 It is definitely not a coat you would wear out alone in this negative twenty weather in Toronto, but with layering you can make it work, or if you are in your car most of time, this look would definitely work out for you. I styled this looks with some of my favourite essentials of this year, I recently splurged on this beanie from Moncler for myself this Christmas. Yes, if you search this pompom beanie up, it is $390 plus taxes, insane price for a hat I know. For sure you can find a cheaper alternative everywhere! But I just think I actually wear this kind of hat a lot every year around this season, I might as well invest in something nicer and last more than just a year wear. More on the accessories, I paired with a Black and Silver Louis Vuitton scarf, which I had my eyes on for a year now and checked it off my list. I like the pattern and how big this scarf is, but only downside to this scarf is the silk material, really wish it was thicker material so it can be more suitable for Canadian weather. Underneath this statement jacket, I'm just wearing some basic thick black sweater and a basic ripped at the knees black jeans.